We've updated the look and feel of our app for Android and improved the navigation and experience. Most notably, we've consolided all payment options into the Pay menu, added the ability to open new accounts, and streamlined mobile check deposit. Note: Requires Kit Kat 4.0 or above. Learn more about what's new in this update. Do Your Banking, Anytime, Anywhere. 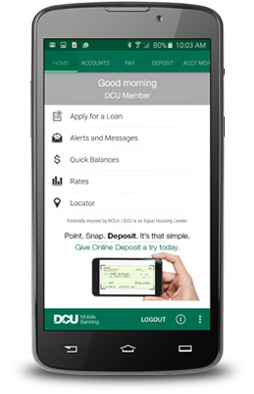 DCU's Mobile Banking App gives you quick, convenient access to most Online Banking features from nearly anywhere! DCU Security Assurance includes a secure login, member number and password privacy, data encryption using HTTPS/SSL, and session timeout configured to 20 minutes - so you can use the app knowing that all of your information is secure. Accounts Overview – Touch Accounts to bring up a list of all your DCU accounts with their current balance information. Transfers – Located in the lower-right corner of the Accounts screen, touch the money icon to quickly and easily transfer money between your DCU accounts. Account Details – Touch any account to view your available balance, any pending transactions, completed transactions or to transfer funds.